Premier Montvale Address Draws Renters to Nottingham Manor - Alfred Sanzari Enterprises, Inc.
Nottingham Manor, a premier garden apartment complex developed by Alfred Sanzari Enterprises and professionally managed by FirstService Residential, benefits from the unique attributes of its location in Montvale. This picturesque and family-oriented borough in the heart of the Pascack Valley region is among Northeastern Bergen County’s most vibrant suburban communities. The complex, which has consistently high occupancy levels, is home to a wide mix of residents from young singles and couples to growing families and empty-nesters. This year, modifications are being made to include open floor plans and modern, updated kitchens for new residents moving to the property. In addition, gardens and landscaping throughout the 10-acre property have a fresh new look, according to John Tantsits, residential building technician. 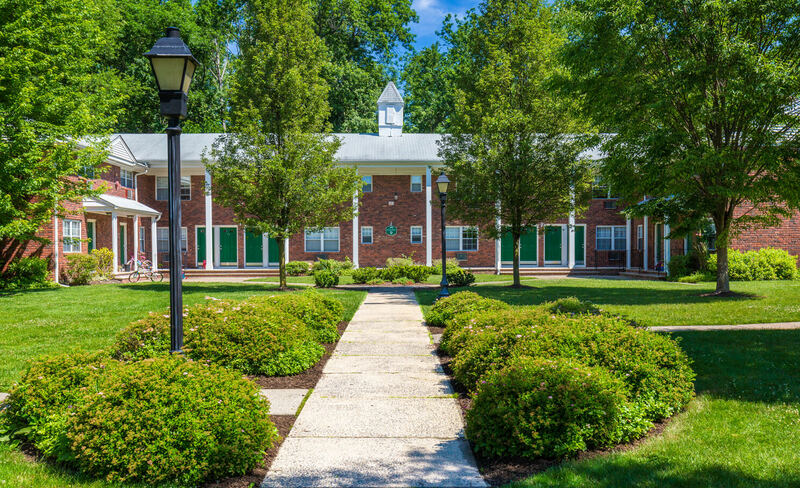 Bordering New York’s Rockland County, Montvale is just 15 miles from New York City via the George Washington Bridge and within close proximity to NJ Transit and major highways, shopping, dining, healthcare facilities, and cultural attractions. Locally, the municipality is home to the corporate headquarters of multinational corporations. Four parks encompass 32 acres in Montvale, with recreational pursuits including tennis, basketball, football, baseball, roller hockey, softball, soccer and two playgrounds. The highly-regarded Montvale School District, among the top-rated districts in the state, makes the borough particularly well-suited for families with young children. Located at 1-186 Nottingham Court, Nottingham Manor is a mix of one-bedroom apartments ranging in size from 700 to 750 square feet, and two-bedroom duplex units ranging from 1,040 to 1,140 square feet. All apartments include open concept floor plans, ample closet space and polished hardwood floors. Tenants benefit from an on-site laundry room, quiet and well-manicured grounds, and convenient parking throughout the complex. For more information or to inquire about leasing specials contact Rafael Dalmasi at 201-741-2333. Prospective renters also can visit www.sanzari.com to view property photos and download rental applications. Headquartered in Hackensack, Alfred Sanzari Enterprises is a multi-generation family owned and managed business, and one of New Jersey’s premier real estate developers, owners and managers of commercial and hospitality real estate. The organization continues to strategically expand and diversify its industry-leading portfolio through both development and acquisitions. The company prides itself on its integrity and is known for the quality design and construction of its buildings, proactive and responsive property management team and outstanding relationships with its tenants. Many of Alfred Sanzari Enterprises’ office, industrial, medical, residential and hospitality properties are iconic landmarks in their respective markets, including the Alfred N. Sanzari Medical Arts Building in Hackensack and Glenpointe in Teaneck.